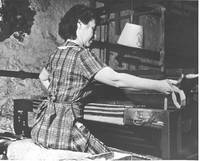 Dorothy Trumpold weaving carpet strips on her hand loom. 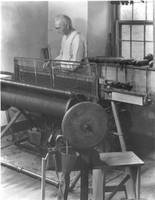 Emil Schaufuss weaving carpet with a semi-automatic loom. Shuttles stuffed with colored rag strips line the window sill behind him, with the shuttle stuffing machine, used to prepare the shuttles, in front of the loom. Amana Woolen Mill complex including the Building Department looking NE from the south side of the Millrace. 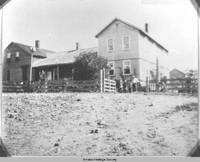 Photograph taken from the North side of the Millrace, facing south. The Amana Refrigeration, Inc. plant is behind the Millrace in the former Middle Amana Woolen Mill building. 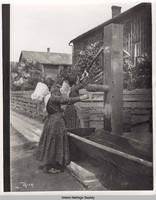 Albert Fels on a bicycle in Homestead with a communal residence, a tinshop, and a grape arbor in the background. 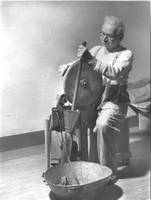 A photograph taken of Henry Schumacher, Amana blacksmith, in August 1937. 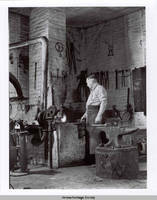 He is standing at the forge. There is an anvil in the foreground and a hammer on top of the anvil.